The Ramakrishna-Vivekananda Center of New York observed the 150th birthday of Holy Mother Sri Sarada Devi in two phases. 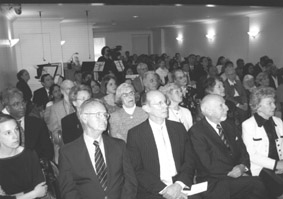 The first phase took place on Sunday, 21 December 2003, at 11:00 am, when a special service to commemorate the occasion was held in the Center’s chapel. The devotees attending the service filled the chapel. Those who could not be accommodated in the chapel were able to observe the service by means of closed-circuit television in other locations in the Center. Swami Adiswaranandaji gave a talk on ‘Holy Mother, Embodiment of Divine Grace’. Vedic chanting and devotional songs were performed by the Center’s choir. Following the service, a full-course dinner was served to the entire congregation. Throughout the season all books on the life and teachings of Holy Mother received a special discount at the bookshop and through the Center’s catalogue and website. Swami Adiswarananda, Ramakrishna-Vivekananda Center of New York; Swami Tathagatananda, Vedanta Society of New York; Swami Chetanananda, Vedanta Society of St Louis; Swami Tyagananda, Ramakrishna Vedanta Society, Boston; Swami Yogatmananda, Vedanta Society of Providence; Catherine B Carlson, daughter of Chester F and Dorris Carlson (Chester F Carlson, scientist, inventor of Xerography and past president of the Center, and Dorris Carlson are noted for their lives of selfless service); Gerald P Gehman, President, Willard Straight Block Association, New York City; Alex Herrera, Director of Technical Services, New York Landmarks Conservancy (Erin Tobin Beardon of the New York Landmarks Conservancy’s Sacred Sights Division represented Mr Herrera, who was unable to attend); Dr Mahendra Jani, Chairman, Department of Mathematics, William Patterson University, New Jersey, and Founder and President, Vivekananda Vidyapith, New Jersey; Henry Kohn, Past President, 92nd Street Young Men’s Hebrew Association, New York City, and Founder and Director, American Jewish Society for Service; Dhan Gopal Mukerji Jr, lecturer on international affairs and son of noted writer Dhan Gopal Mukerji (Dhan Gopal Mukerji’s book, The Face of Silence (1926), is an English biography of Sri Ramakrishna that introduced Sri Ramakrishna to many notable personalities of the time, and thereby contributed significantly to the spread of the Master’s teachings in the West); Dr Jerome J Pollitt, Professor and Former Dean of the Graduate School, Yale University, and President, Ramakrishna-Vivekananda Center of New York; Jon M Sweeney, Editor-in-Chief, SkyLight Paths Publishing, Vermont, and author of Praying with Our Hands, The Road to Assisi and The St Francis Prayer Book. Details of the programme follow. The tribute and concert in honour of Holy Mother was held on Friday, 23 April, at 7:30 pm at the New York Academy of Medicine Ho­sack Hall, 1216 Fifth Avenue, 103rd Street, New York. 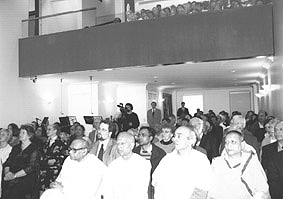 As the devotees gathered and filled the beautiful 500-seat auditorium, they were greeted by a large image of Holy Mother projected onto the wall above the stage, while the organ provided a musical prelude. The programme then began with a procession of the swamis and other participants. Leading the procession was a group of more than thirty students of Vivekananda Vidyapith, who made their way towards the stage while performing inspiring Vedic chanting. After the chanting, the choir of the Ramakrishna-Vivekananda Center performed devotional hymns and songs as offerings to Holy Mother. The chanting and music were enhanced by the projection of beautiful images of Sri Ramakrishna, Holy Mother, Swami Vivekananda, holy places of India and a variety of colourful flowers and natural scenes. 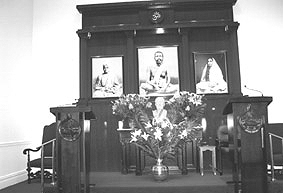 Swami Adiswaranandaji then welcomed the distinguished participants and spoke briefly on the life and message of Holy Mother, and said that in the advent and life of Holy Mother Sri Sarada Devi we find a modern-day fulfilment of the promise of Lord Krishna in the Bhagavadgita that from time to time in the history of humanity, whenever the need arises, the Lord incarnates in the world to set things right and guide us towards our spiritual destiny of unity with the Divine. ‘One hundred and fifty years ago,’ the swami continued, ‘in the small village of Jayrambati in West Bengal, India, was born such a divine personality, Sarada by name, who would later come to be known affectionately by her devotees in India and throughout the world as Holy Mother. A rare combination of human and divine qualities, Holy Mother continues to inspire millions of spiritual seekers. Her life and teachings touch our very souls and grant us peace and joy. In her invisible form she continues to give her blessings, even today, to anyone who accepts her as the real Mother and surrenders to her. Holy Mother Sarada is our real Mother, not an adopted mother, nor a vague mother, but our real Mother.’ The swami concluded his remarks on this auspicious occasion with a prayer to Holy Mother for her blessings of peace and happiness for all. Swami Adiswaranandaji then introduced the distinguished participants, the four guest swamis and Jon M Sweeney, who proceeded to the podium in turn, each offering beautiful words of tribute to Holy Mother. After the conclusion of this tribute portion of the programme, the swami introduced the musical artists of the Randy Armstrong Ensemble, who then began their concert, blending sounds from East and West and featuring an impressive variety of instruments from all parts of the world. Each musical selection was received with enthusiastic applause, and at the concert’s end the audience expressed its appreciation with a standing ovation that subsided only when Swami Adiswaranandaji thanked the artists and once again offered a prayer to Holy Mother for the welfare of all. Feeling greatly uplifted by the evening’s tributes and musical offerings, the devotees looked forward to the two remaining events of the weekend: the symposium on Holy Mother and the Center’s building dedication. The symposium, entitled ‘Make the Whole World Your Own’, took place on Saturday, 24 April, at 7:30 pm in the chapel of the Ramakrishna-Vivekananda Center at 17 East 94th Street, New York City. Nearly 300 devotees attended. The programme opened with the offering of Vedic chanting and devotional songs by the Center’s choir, after which the life and teachings of Holy Mother Sri Sarada Devi were beautifully presented in talks given by Swami Adiswaranandaji and the other swamis, Dr Mahendra Jani and Jon M Sweeney. The presentations served to illustrate Holy Mother’s teachings and how those teachings found expression in every aspect of her life. The three-day programme concluded on Sunday, 25 April, at 11:00 am at the Center with a special service to dedicate the Center’s newly renovated buildings. The programme’s theme was ‘The Spirit of Service’. 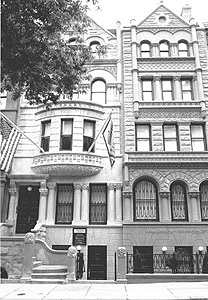 In 2001 the Center purchased the adjacent building (19 East 94th Street), and soon thereafter embarked on an extensive project to join the acquired building with its own landmark building, restore the architectural details that had been lost over the years from the facade of the adjacent building, and completely renovate both buildings. Having almost completed this project after more than two years of work, the Center chose to formally dedicate the buildings as part of Holy Mother Sarada Devi’s 150th birthday celebration. On this sunny Sunday morning about 300 members and friends came to help the Center dedicate its newly expanded facilities. Everyone was very happy to see the bright new facade of the Center and its chapel and other rooms tastefully decorated with flower arrangements for the occasion. Swami Adiswaranandaji then introduced the visiting swamis and other distinguished participants, who spoke on ’The Spirit of Service.’ The swamis focused on the ideal of service as it pertains to the Ramakrishna movement as well as to the lives of spiritual seekers. Other participants reflected on the history and tradition of the Ramakrishna-Vivekananda Center of New York, its founding by Swami Nikhilanandaji more than seventy years ago, and recalled various interesting chapters in the Center’s history. Community leaders addressed the Center’s role in the community and thanked the Center for this latest contribution to the city and neighbourhood - the restoring of a landmark building to its original beauty. 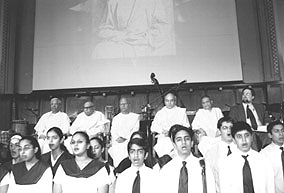 The dedication programme was brought to a conclusion by a joyous song by the choir, after which Swami Adiswaranandaji requested everyone present to join in a prayer to Sri Ramakrishna, Holy Mother and Swami Vivekananda so that the Center may continue to serve as a source of spiritual inspiration for all. Following a brief tour of the Center, all in attendance were given a tastefully prepared luncheon and a souvenir of the occasion.